Sometimes plans don’t turn out how you’re expecting, but that’s not always a bad thing, especially when food is involved. Or at least that was the case for me a few weeks ago. I was really looking forward to the event, especially after Ryan responded so positively to my dietary requests. She was quite happy to modify the menu for a couple of vegetarians, and seemed unfazed by my additional ridiculous food preferences, like not wanting mushrooms or eggplant. (What kind of self-respecting vegetarian doesn’t like mushrooms or eggplant?) So I was disappointed to say the least when she emailed a couple of days before the planned eating fest to say she hadn’t gotten enough people signed up so, regrettably she was canceling. But then she casually suggested that instead of refunding the cost, she would be pleased as punch to make us 5 dinners, that adhered to our high maintenance food requirements, and deliver them to our house instead! Are you kidding me? I couldn’t answer “yes” fast enough. Two days later, a perky, friendly, and warm-hearted chef arrived at our door with 5 pre-packed meals. And today I’m sharing with you the spectacular week of food we got to enjoy courtesy of Miss Ryan. 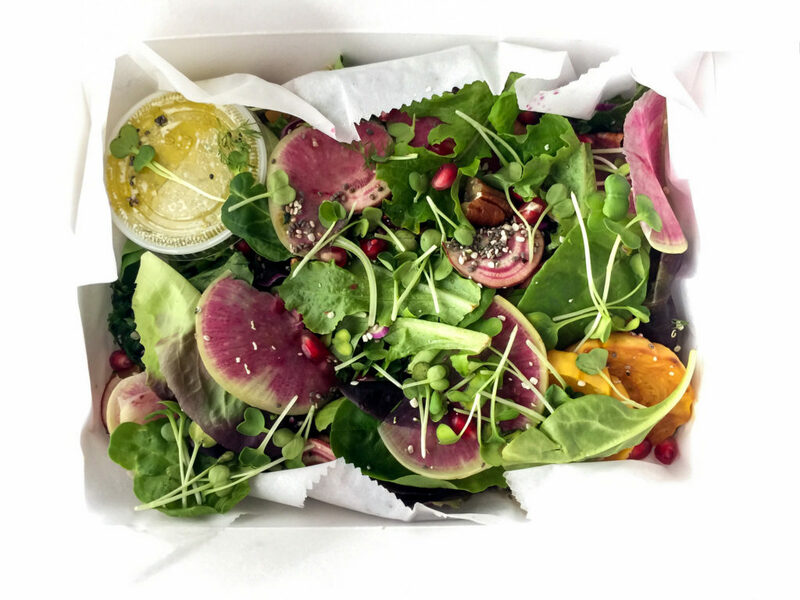 Greens, radish sprout, beet, radish, pomegranate, chickpea, chia seed, raw pecan, hemp seed, delicata squash, kale, and red cabbage with a dill, pine nut, and lemon vinaigrette. Have you ever seen a more gorgeous salad? I certainly haven’t. And I was so impressed by how beautifully presented the food was, despite being packed in paper to-go containers. I think I ooooed and ahhhhed out loud as I opened each one. We could put the food directly onto plates and serve up without really any preparation or garnish. In fact, we probably could have just grabbed a couple of forks and eaten them straight out of the package. No plating necessary. 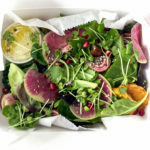 The Superfood Salad had such a variety of ingredients, including a bunch of different kinds of greens. This wasn’t your standard romaine lettuce salad. And the creative collection of vegetables, fruit, nuts, and seeds that were put on top! It was a good reminder to me that you really can add anything to a salad. You don’t have to stick with the time honored salad bar fixins like carrots and croutons. And to top it off, the fresh, creamy, tart lemon dressing brought the fat to the party and was a perfect foil to the slightly bitter greens, and remarkable mix of textures from the garbanzo beans, pecans, and pomegranate. Since the entrees were small, we did have to supplement a bit to make the singular dishes into full meals. We made simple cheese quesadillas to nibble on alongside this colorful salad. And sadly, with each dish there were no leftovers. 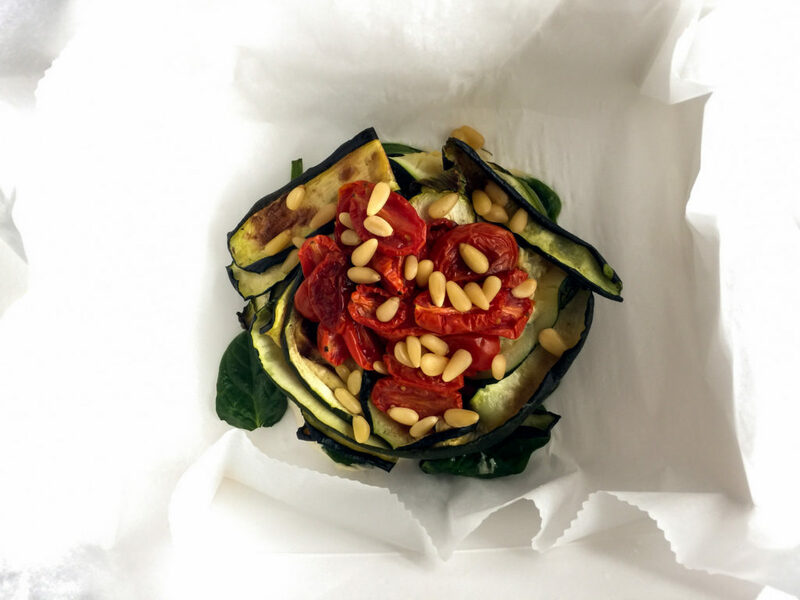 Tomato, zucchini, spinach, cashew cream, pine nuts. For some reason I felt compelled to warm this darling little lasagna for 30 seconds in the microwave. So it wasn’t exactly hot or cold when we ate it, but sort of in between. The sweet tomatoes were unbelievably flavorful. And the layers of zucchini and cashew cream on the bed of spinach weren’t slimy at all, which my texture-sensitive mouth was a little wary about. Honestly, with such straightforward ingredients, I was surprised at the punch of flavor it provided, and pine nuts offered the perfect crunchy element. We split the lasagna and paired it with noodles with olive oil and Parmesan cheese. Sweet potato, spinach, coconut butter, olive oil, raw pecan, sesame, pumpkin seed, pomegranate, cashew sour cream. OK, I’m going to start repeating myself. I can’t help it. Have you ever seen a more beautiful sweet potato? Geez. I never would have thought to put such interesting toppings on my spud. (I guess that’s why I’m not a personal chef.) From a nutrition perspective it’s marvelous. 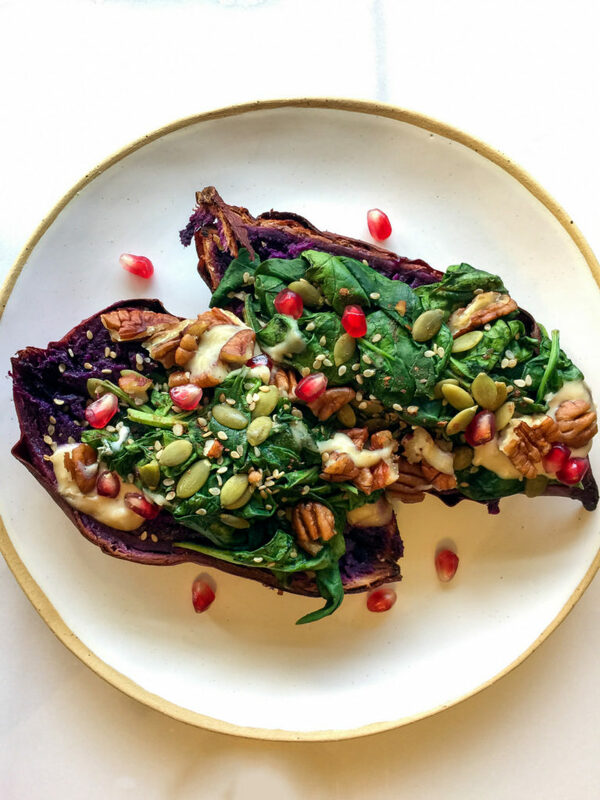 There are so many phytochemicals on the plate from the purple potato, dark green spinach, and bright red pomegranate. From a taste perspective, it was earthy and excellent, and we opted for vegetarian chicken patties to complete the meal. I’m going to try to keep this one on my list as an idea for an easy, colorful side dish. Whole wheat flour, coconut oil, poppy seed, broccoli, cauliflower, caramelized onion, dijon, cheddar cheese, cashew-pine nut cream. It may seem odd that I’m including pictures of the food in their to-go containers. But I wanted you to see with your own eyes how lovely they looked as packaged. 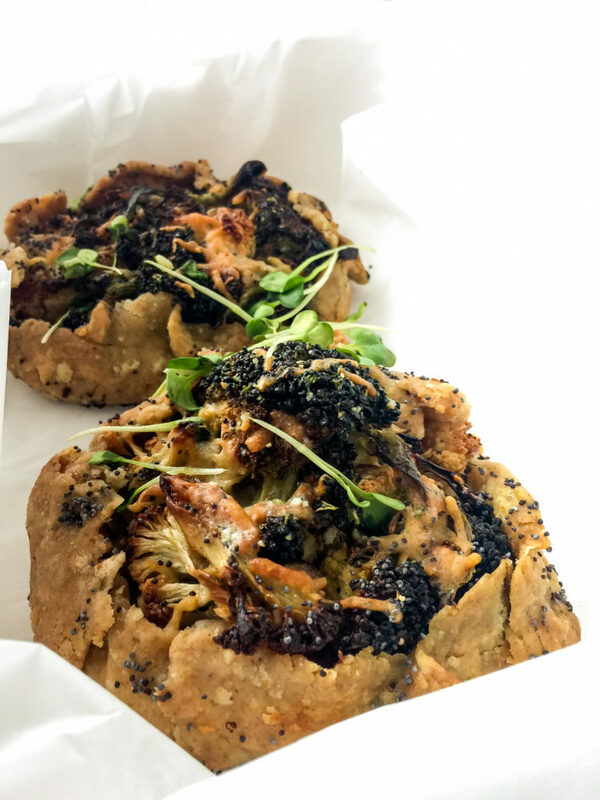 These delectable tarts had a flaky crust and a savory filling. Even after being reheated in the microwave they stayed crispy. The broccoli, cauliflower, and onion were flavorful on their own but the cheddar cheese provided just the right amount of saltiness. We served them up with a side of baked tofu, and it made for a delicious meal. 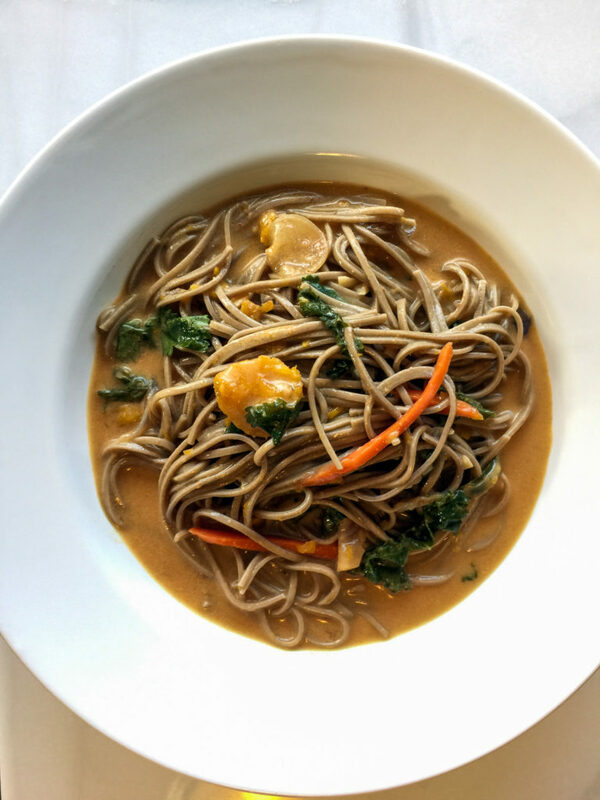 Coconut milk, pumpkin, kale, cabbage, radish, peanut butter, soba noodles. The last dish of the week. I really hated to see it come to an end. The ramen was good, and I thought the pumpkin was a creative, and seasonally appropriate, ingredient. We added shelled edamame to boost the protein, and had a simple salad to round things out. I’ve reviewed my share of dinner kit services on the blog, but if I had to pick my favorite way to get dinner on the table in a hurry with little or no effort, it would be this. I mean it couldn’t be more personalized, fresh, or healthy. Of course partaking in this wonderfulness every week would be cost prohibitive, but it sure was nice for those 5 days. 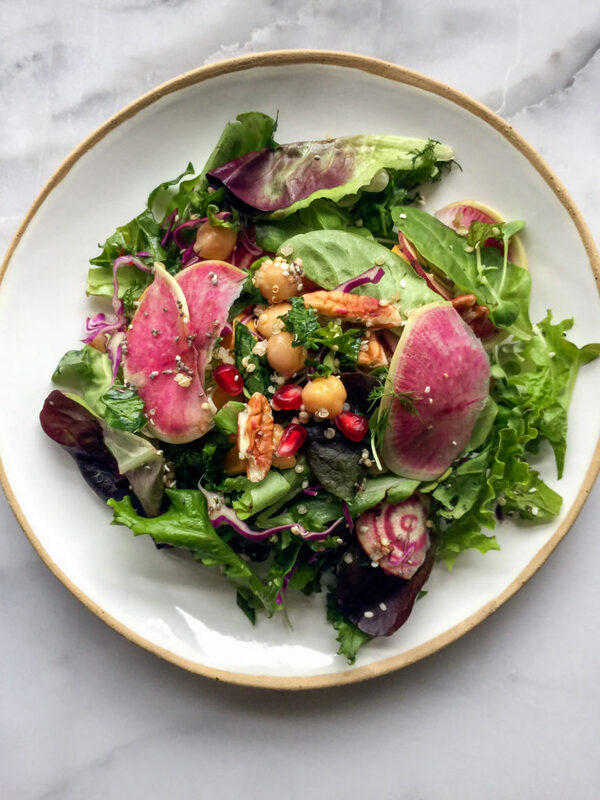 If you want to partake of this very same wonderfulness in your very own home, Ryan offers various healthy culinary services including in-home cooking and prep, weekly deliveries, and in-home private dining for many occasions. She’ll also cook up a storm for holiday parties or weddings. When Ryan delivered our dinners we chatted briefly before letting her depart to get to her other anxiously awaiting families. After thanking her profusely for the food, and the delivering, and the accommodation of our food rules, she actually uttered these words: “Oh, I love dietary restrictions.” Now that’s a personal chef this dietitian, and picky eater, can get behind. Have you ever used a personal chef to fill your fridge for the week? Did it feel indulgent? It sure did for me. And it was marvelous. Kristine- these items looks so beautiful…….you weren’t kidding! Such presentation and nutrition, I can see why you were happy. Wow. Gorgeous meals! And I totally get your aversion to mushrooms.